Church’s talent did not go unnoticed and before he was 30, he already had become a renowned artist. He is recognized today as one of the most important figures of the Hudson River School, a group of artists who, imitating the European Romantics (such as Turner, Whistler and Cotman), found inspiration in strictly American landscapes. Unlike other artists of the School, Church was taking a more scientific approach to the motifs of his work and, therefore, his paintings are more detailed and accurate than those of his contemporaries. Niagara Falls of 1867 is one of the four paintings he made ​​during his mature age. To paint it, he used a colored photograph and a drawing of the landscape he made beforehand. What is striking about the work is the number of tones and details that Church achieved from this photography and drawing, since, as stimuli, are a little rough. Probably, like Turner, the artist had the ability to memorize colors and was able to transfer them onto the canvas. 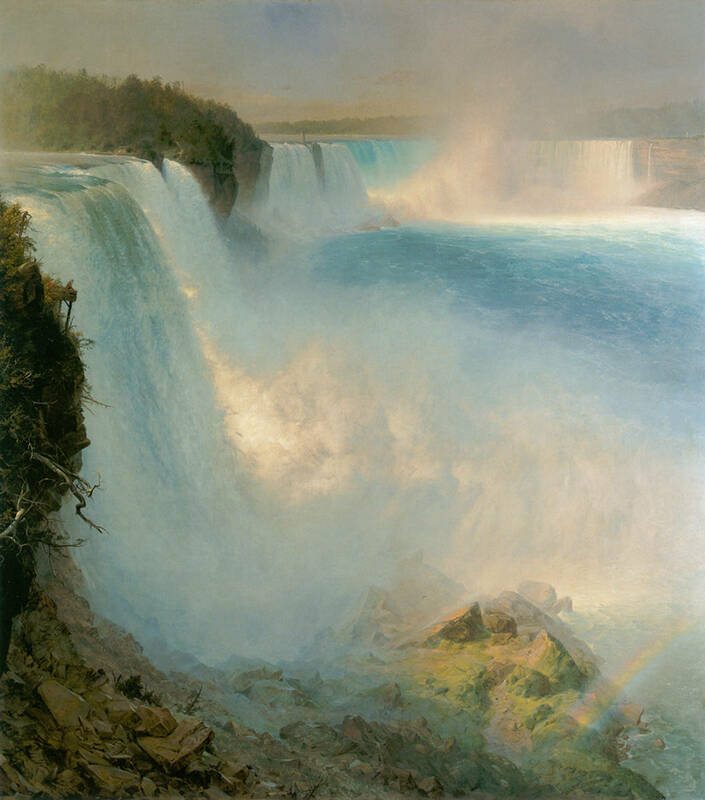 Church’s vision of the Niagara Falls, consistent with the Romantic movement, it is quite idealized: the water appears blue, clean, and looks more like a landscape from the Caribbean than from a muddy river in the northern United States; the rainbow in the lower right corner of the painting reinforces the idealization of the landscape. In painting, we can feel the brutality of the force of water at the same time we can admire the nature of the place quietly, and that is why the series of falls Church painted continues to be irresistibly attractive. ~ by Álvaro Mazzino on February 10, 2012. E-lodge Niagara is one of the best motel of the Niagara Falls Vacation, which offers best quality accommodation for great vacations experience.15 Minutes’ walk to the Falls. It is centrally located among the best Niagara Falls hotels and motels and that easily accessible from Toronto. We are close to the attraction but far from the noise. Hi, ӏ loog onn tto ƴour bloig regularly. Υour story-telling stylee iss witty, keeep uup tthe glod աork! This entry was posted on February 10, 2012 at 15:23 and is filed under Romanticism.You can follow any responses to this entry through the RSS 2.0 feed.You can leave a response, or trackback from your own site.